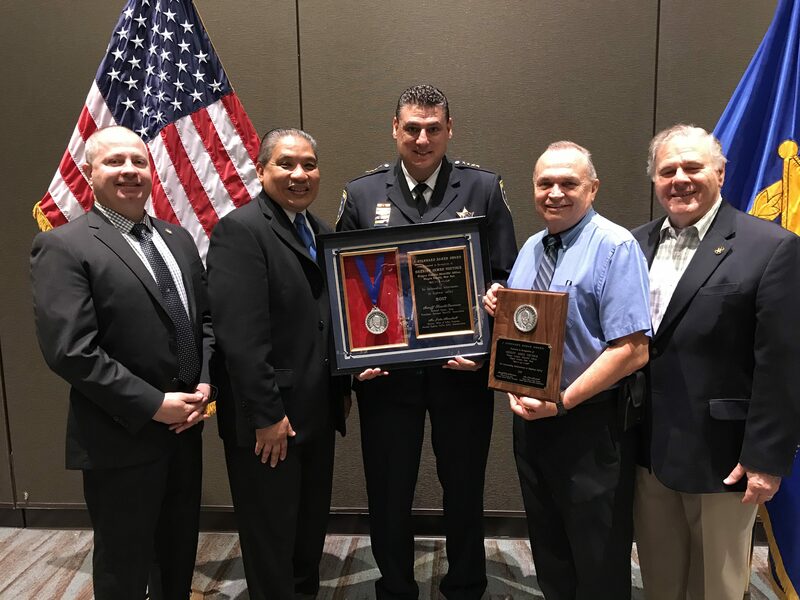 Niagara County Sheriff James Voutour is the 2018 recipient of the J. Stannard Baker Award for Highway Safety, which is presented annually by the National Sheriffs’ Association to an officer who has shown unusual initiative directly related to highway safety. The award is sponsored by the US Department of Transportation/National Highway Traffic Safety Administration, the Center for Public Safety at Northwestern University, OnStar, and the National Sheriffs’ Association. Photo (l to r): Anthony D’Agostino, NYSSA Law Enforcement Liaison to the Governor’s Traffic Safety Committee; John Marshall, Director, Office of Safety Programs, NHTSA; Niagara County Sheriff James Voutour; Sheriff John Whetsel (ret), Oklahoma County, OK, chairman of the NSA’s Traffic safety committee; and NYSSA Executive Director Peter Kehoe.